[One of the handlers] told us, "they claim the vans are temperature controlled, but I know for a fact that there were many summers where the vans temperatures just didn't work." 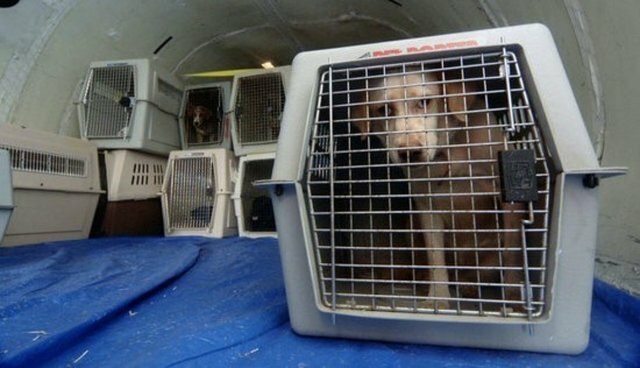 The former handler also told NBC that while Pet Safe offers travelers the option to track their pets in transit, United does not take great pains to ensure that the animals arrive at the correct destination. "I was there when they sent a dog that was supposed to go to Florida to Hong Kong," he said. "Somebody just put it on the wrong plane! That person was back at work two days later." According to the report, the former employees attempted to bring their animal welfare concerns to United's attention to no avail. Despite being presented with pictures of dogs suffering on hot tarmacs, the company has failed to address the allegations of neglect thus far; United released a statement that claims the company couldn't respond to the whistleblowers' claims. The DOT told us that the rules require airlines to report the "loss, injury or death" of pets while in the custody of the airline. "Illnesses are not required to be reported," said [a] spokesperson. If [a pet's] injuries were determined to actually be "illnesses" the incident would not have to be reported. "Bottom-line is they need to change procedure," one of the former handlers told NBC. "Change regulations for the health of the animals. Not for the sake of making money... People need to be held accountable."